Risk-on back on after clarity on Fed policy, trade.After a speech from Federal Reserve (Fed) chair Jerome Powell last Wednesday provided relief for investors that policy would not be as tight as feared in the coming year, global equities momentum is continuing after the U.S. agreed to postpone a planned increase in tariffs on $200 billion of Chinese goods as the two countries restart negotiations in earnest. The two sides are set to meet in Washington beginning in mid-December with a focus on the longstanding issues troubling American business leaders, including the forced transfer of technology, intellectual property protection, and cybersecurity. It is also expected that China will purchase more U.S. goods in agriculture, industrials, and technology. The goal is that the opening of these markets will help restore balance to global trade, while reducing the costs of cross-border commerce. 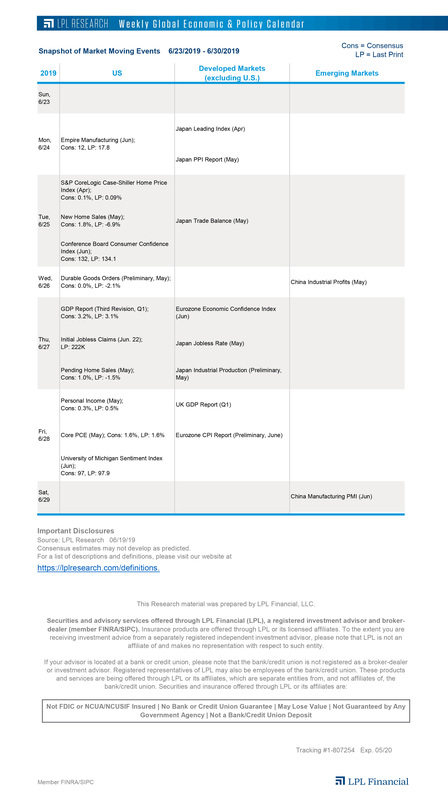 While hard-liners may view the truce as a temporary delay tactic, we view any clarity relative to supply chain disruptions, input costs, and tariffs as supportive for further growth in trade and capital investment. It should also be noted that the 90-day timeframe, ending on or around March 1, would occur just before China’s annual national legislative session, normally a period where Chinese leaders are wary of making international concessions. Any escalation of the tariff war could be perceived as embarrassing for President Xi leading into this meeting. In our latest Weekly Market Commentary, due out later today, we share more of our thoughts on these major market-moving events and reiterate our positive stock market outlook. Oil catching a bid early. WTI crude is set to begin the week sharply higher on news that Russia and Saudi Arabia have announced an agreement to manage the oil market with the expanded members of OPEC, dubbed “OPEC+.” Though output cuts have not been confirmed by the group, the initial agreement opens the door to a production cut deal. Reports also suggested that the Canadian province of Alberta will cut oil production by almost 9%, or 325k barrels/day, to manage a pipeline bottleneck that has doubled the storage levels in the province. The U.S., though, is also producing record output, which contributed to oil’s ~22% plunge in November, and the influx of supply has put more pressure on OPEC + and non-OPEC producers to curtail output in the coming year. Consequently, we continue to believe that lower oil prices are primarily a supply-related issue and not indicative of global demand issues, and look for WTI to trade ~$65/barrel by the end of 2019.